Daphne kept her smile from falling as the dance ended. What did you expect? she asked herself, angry that she had let her enjoyment distract her from their purpose. Aside from its applications in her work, dance was a useless entertainment. Who did she think she was to relish laughter when better skaa than her were screaming and moaning and dying in the streets every day? Trev's purpose today was to teach her practical skills that might save her life one day, or could be used to help the rebellion. Help the rebellion? I sound like a new recruit. Daphne knew what she was. She was a prostitute, nothing more nothing less. She would do what she could to aid the rebellion to the best of her abilities, but she wouldn't delude herself by thinking she was worth more than she was. Trev was saying something about strange things. Somehow, Daphne doubted any position he thought of or request he had wouldn't be anything near as strange as what she had seen from clients. She kept this observation to herself, however, and got into the position that Trev described. She let her negative thoughts go and attempted to lose herself in the focus it took to position her muscles correctly and distribute her weight just so. While she was a stranger to combat, one thing Daphne was comfortable with was her body. She knew every sinew of it well enough to be reasonably certain after a moment of settling that she had her posture and pose correct. "How's this?" she asked, keeping her answer short out of practicality, and so that he would not be able to read any melancholy in her voice. Daphne had a tendency to stand off-balance when she wasn't thinking about it, with a posture intended to emphasize her body's appeal. It was what she needed for her job, but no good for what Trev wanted to show her here. She had mirrored his own stance when he explained it, though, and that was better. He gave her a critical look, then told her, "One way to find out." Trev gave her shoulders a shove, not too roughly, but wanting to test whether she'd stumble or not. Only her instincts prepared her, tensing her previously relaxed muscles when Trev suddenly moved to shove her. She budged a bit, but quickly stabilized, noting the the way she had absorbed his force with her frame. He's strong. His shove hadn't been overly forceful, but in their brief moment of contact, she had felt the energy stored in his muscles, and the force that was waiting to be released. What would it be like to have that sort of power? The ability to use force to achieve goals and protect the ones you loved? 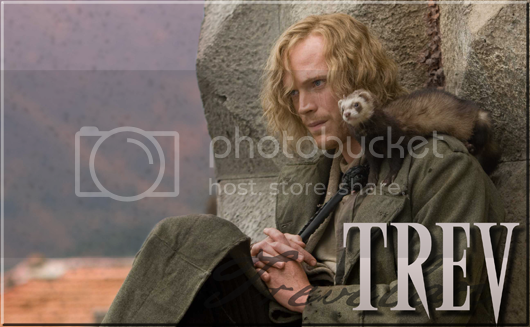 Even without pewter, Trev was obviously a formidable fighter. Daphne wondered how much allomancy would make him capable of. "I can see how this can be useful," she said after a moment. "Should I be keeping my muscles loose, or tensed? It seems like if I'm too relaxed I'll be able to be pushed over, but if I am too rigid I feel like I wouldn't be able to adapt." "You want to stay loose," Trev answered. "If you stay tense, you'll wear yourself out too rapidly, and you won't be as fast or as fluid. You'll be injured worse, too, if you're hit or if you fall." She was good at dancing, at reading her partner's moves and responding quickly. That suggested she'd be good at this too. "You're not a big woman. You won't be able to overpower an opponent, or probably even outlast them, but if you're quick and precise that won't matter. You want a style that's more about leverage and balance than about strength or even speed." Daphne smirked inwardly when Trev commented on her size--she might be small, but she felt like a giant compared to him! Nonetheless, she kept her feelings to herself, not wanting to give offence. Valerre likely would have guffawed and made some witty remark, but then, there was a reason that Daphne was Valerre's only friend. And, for one reason or another, Daphne found herself genuinely wanting to be Trev's friend. The training continued, Trev giving her pointers on her stance and posture, how she was moving. It was hard not to feel like she was a complete failure, doing everything wrong, but Trev's gentle encouragement kept her going, until she finally started to feel like some of the concepts were sinking in. "You know," she said, smiling in response to the satisfied look on Trev's face as she finally executed the move she was trying correctly. "You might be wasted as rebel. I'm not an expert of course, but it seems you'd make an excellent instructor. With your talent, even a noble house surely wouldn't turn up their nose at hiring a skaa." Daphne learned quickly; her dance training helped her a good deal physically, giving her some strength and stamina, improving her balance, and pattern recognition. Trev was honestly impressed. He'd taught her basic footwork and how to fall. They'd worked on overcoming her reluctance to strike - he'd made her hit and kick him repeatedly, Trev focusing less on technique and more on simply getting past the natural inhibitions a lot of people had. He had pewter, she wasn't going to be able to really hurt him. He had to remind her about this several times before she started actually hitting full-force. He wasn't going to turn her into a seasoned fighter overnight, so he focused on the things that would be most valuable to her right at the start, teaching her a few simple wrist locks and throws, and how to escape from a few different holds. She'd just successfully completed one of the throws, sending Trev tumbling end over end; he came up onto his feet at the end of his roll, grinning. "And here I was hoping maybe you were going to say I should be a dancer," he said with mock disappointment. There had never been a chance in the world that Trev was going to end up teaching nobles to fight, but he kept that to himself. "No instructor is worth much without a good student or two, though. And you're quick, clever, and stronger than I anticipated. I think we'll have to give it a rest for today, but if you're interested in continuing tomorrow, I'd like to keep on working with you. If you know anyone else who might like to join us, I'm happy to work with them as well. I'd like it if every person in this cell had some idea of how to defend themselves. Any one of us could end up needing it." Edited by Borborygmus, 29 July 2017 - 03:26 PM. Daphne couldn't help but be impressed by Trev's grace as seemed to fall naturally to his feet from where she had thrown him. She'd have to get him to show her that next time. Daphne nodded in response to his offer for further training, growing thoughtful. "You're right, of course. Tura has us focused on gathering information, but we're still fighting a war." Training could be just the ticket for some of the girls and women in the cell--something to distract them from their work, and to make them feel strong and powerful despite their situation. "If that offer is genuine, I'm sure I could round up a group." Daphne absently began straightening her clothing, some of the loose fabric had become bunched during the training, and was clinging to her at odd angles. "We should probably start small--to work out any kinks before the group gets too big. I also wouldn't want to take too much of your time, so we could try it out irregularly to start, and then see if there's room in your schedule for something more regular? Tura won't like too many women off duty at once either, and I'll have to be careful who I select to start out. They'll need to be eager so their enthusiasm will encourage others, but discreet, just in case it doesn't work for more to join." Daphne shook her head, realizing she had started pacing. "But I'm getting a little ahead of myself. You have to be careful what you offer of yourself, Master Trevelan." She chuckled, hoping to relieve any tension that had built up. "Though, I really think you are correct about more of us needing this sort of training. Do you think any of your men might be prevailed upon to assist if you are unable to?"